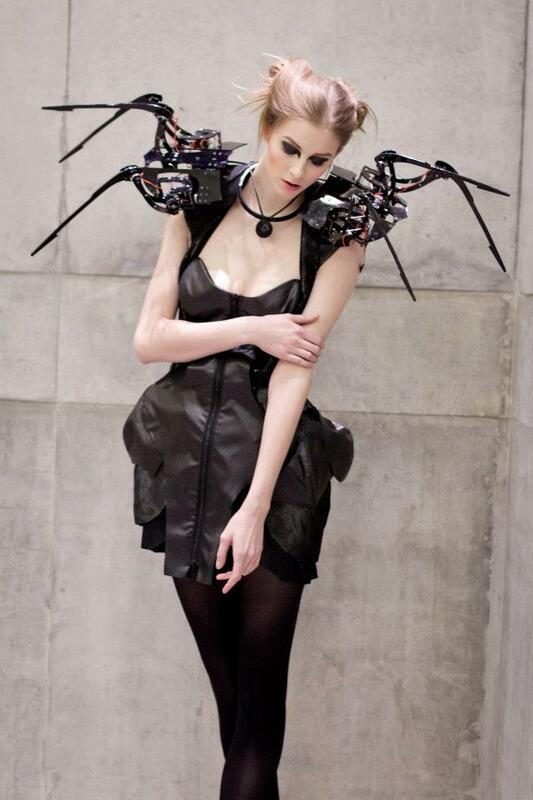 In collaboration with engineer Daniel Schatzmayr, Anouk Wipprecht’s latest techno-couture creation is a sinister robotic spider dress. Perched on the wearer’s shoulders are animated robotic limbs that eerily crawl around the body. The robotic dress both incites the curiosity of passersby by coyly dancing around the wearer’s body while at the same time protecting the wearer if somebody approaches too fast or comes to close. The performative garment deals with themes of “personal space” and raises questions concerning control and privacy. As with with much of Wipprecht’s past work, the space of the body is once again transformed into a stage where the garment becomes the leading actor. Read this wonderful interview to learn more about Wipprecht’s past work. Color-changing Clothes- A Bright Spot In Economic Gloom?